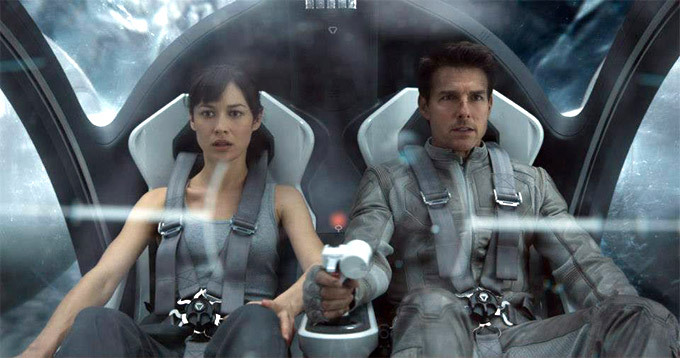 Oblivion obviously wasn’t intended to be much more than a sci-fi blockbuster. It’s a star vehicle with a big budget that promises thrills and only somewhat delivers on them. Even the word “drone” is enough to spark something in the audience, though, but the script uses it more as a buzz word to add meaning rather than expanding on it. The movie is so sanitized and processed that it feels cold to the touch. Even the love story between Jack and his long-lost wife Julia (Olga Kurylenko) never really has a pulse despite that performers’ best efforts. Melissa Leo shows up in brief flashes on a computer monitor as a charmingly villainous commander from the main human ship, and Freeman’s charisma lifts the movie up in his brief scenes, but it’s not enough. Cruise’s performance isn’t bad, but the story doesn’t take advantage of his physicality enough to warrant him even being here. It’s a movie of spare parts that don’t go to the same machine. This entry was posted in Reviews and tagged 2013 movies, Facism, Joseph Kosinski, Morgan Freeman, Oblivion, Oblivion Review, Olga Kurylenko, Science Fiction, Tom Cruise, Tron Legacy by matterspamer. Bookmark the permalink. Wow. That’s a pretty harsh response to a movie that I found at least entertaining and visually stunning. I do understand what you mean by the “fine polish” that removes the life from it. I didn’t care that much about Cruise’s character, but there was enough within the material to stay engaging. I’d go with a B if I was giving a grade.